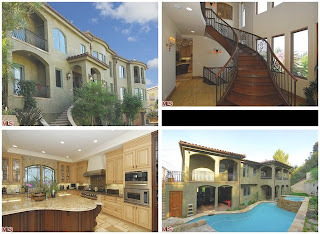 DESCRIPTION: Spectacular old-world Tuscan, architectural manor with Moroccan influences & city light views. Engineer w/ caissons into bedrock, amazing custom stacked stone, saline Pebble-Tech pool/spa, waterfalls, cabana, bbq island, hardwood & stone floors, the ultimate gourmet kitchen, Thermador appliances, windows, copper sinks, Arte de Mexico wrought iron & glass doors wine cellar. Click Read More to know the drama behind the purchase of this house! YOUR MAMAS NOTES: Your Mama has long heard whispers and rumors that 18 year old High School Musical ack-tress/wannabe pop star Vanessa Hudgens was looking to buy herself a house in the Hills of Hollywood. The paps frequently photographed the dark haired gossip glossy favorite touring multi-million dollar properties and several reports came out that she bought this house. But, according to our sources, she did not buy that house. In early August of 2008 while strutting her starlet stuff in borrowed clothes at the Teen Choice Awards, young Miss Hudgens rather brazenly announced to E! Entertainment's super slim red carpet reporter Juliana Rancic that she was in the process of purchasing her first house. Not long after that, Your Mama received a secret communique from a gal we'll call Charity Chitchatter who whispered in Your Mama's big ear that she'd recently heard from someone who would know that Miss Hudgens had closed on her new house. So Your Mama quickly got on the horn and contacted a few folks we thought might know what is what regarding Miss Hudgen's real estate doings and sho enuf we soon heard back from our wickedly well informed source Lucy Spillerguts who told us that the teen aged millionaire recently dumped $2,750,000 on a big house in Studio City, CA. Property records show that in early September, young Miss Hudgens completed the transaction for an approximately 5,200 square foot house in the hills above Studio City that listing information reveals includes 6 bedrooms and 6.5 bathrooms. Children, what in the world does an 18 year old gurl need with a 5,000+ square foot house with half a dozen bedrooms and 6.5 damn bathrooms? Listing information also shows that in addition to all the bedrooms, Miss Hudgen's new abode includes a large entrance hall with a curving staircase where she can practice for her Norma Desmond years, living and dining rooms, a home office, a large gore-may kitchen that looks to Your Mama like it could be in just about any upscale tract house anywhere and a family room that opens to the rear terrace and pool deck. Other amenities of the teenager's three story abode include hardwood and stone floors, glittery views over the San Fernando Valley, three fireplaces, a three car garage where she can park her pricey Audi convertible, multiple terraces overlooking the back yard and all sorts of wrought iron detailing Your Mama assumes is an attempt to give the house a neo-Tuscan/faux Mediterranean/Moroccan mish-mash sort of vibe. Ack! Listen people, you can't just slap a tile roof on a house an fill it with wrought iron railings and call it Tuscan because we have been to Tuscany and we are certain there are not many (if any) houses in Tuscany that look quite like this. But then again, Miss Hudgens is just a bizzy teen aged ack-tress giddy and flush with fame and while she may well know a Louboutin from a Blahnik and True Religion from Rock and Republic, what does the gurl know about architecture? Seriously. We imagine her real estate agent could have told her this was High Gothic Georgian-style Center Hall Colonial Revival and what would she know, right? Anyhoo, Miss Hudgen's terraced back yard features a beautifully blue saline swimming pool and spa where she can skinny dip in private after spending the afternoon slapping down the credit card at Fred Segal, a cabana where she and boyfriend Zac Efron and quietly comb each other's hair and paint each other's toe nails, and a barbecue island, whatever that is. If anyone were to ask Your Mama, which of course no one did, we think it might have been more financially prudent for young Miss Hudgens to purchase something a bit more modest in price and size. Certainly she could have found a cute three bedroom cottage in a solid Studio City neighborhood for 1.5 million, right? Afterall, the Disney people will eventually stop making High School Musical movies and then what is young Miss Hudgens going to do to make her mortgage? Sing? Pleeze. Previous to scooping up her own celebrity style spread, young Miss Hudgens shacked up with her parents in the 2,385 square foot North Hollywood house prop records indicate they purchased in September of 2005 for $865,000. It must be kinda surreal to have your teen aged daughter buy a house worth more than three times the value of your own house. Not bad, just strange. Right?